I am lucky enough to be able to go by train to Chicago; I visit my daughter, Katie. She is the product manager at the flag ship Victoria's Secret Michigan Ave. store. I go to the Art Institute when I am there and sit in front of the rooms! It's fun to listen in on the non-miniaturists' comments. I love the whole Art Institute, the Impressionists make me cry. I always wanted to work in a museum, loved art history. I bought the book, too. I look through it all of time. I've read the philosophy of the Kupjacks, make it look real, things don't have to work, light comes from somewhere else, you don't leave lights on when you leave a room, you don't leave doors and drawers open in real life so don't do it in miniature. I believe that way, too. Makes it much easier to blame it on a "philosophy" as to why I don't make my kitchen cabinets open! Ha! Now you would think that I have also been to several Chicago miniatures shows, not a one! I know I would need a LOT of money, so I don't even go. I have never been a "window shopper", when I see something I want, I want to buy it, right then. Now that I am making the furniture and stopped on the corner cabinet I don't need anything. I am a practical person, I work with a budget. I really love making all that I do, but it came from need. I was not satisfied with what I could afford so I taught myself to make the things I liked. Katie lives within walking distance of "Think Small by Rosebud". It is a very nice miniature store and I have fun shopping there when I go to Chicago. They have a workshop in the basement for the miniaturists to work on their projects. The houses are put on wheels and wheeled away when not being worked on to have room on the tables for others to work on their houses. It's great, you just go upstairs and get what you need, keep a list, and keep on working. You should see the houses! Some are replicas of homes in Chicago; I admire all of the miniaturists there. The last time I was there I needed help picking carpet out to match fabric and paint; ladies came from everywhere to help, even offering from their own stash. Nice people! Hi Daisy, I thank you for your kind words about the kitchen. I have an Ethan Allen Catalog, I think they still publish them, it has beautiful room settings, that I have copied, but the most important thing are the measurements. I will convert to 1 inch scale to make my furniture. As I said I made everything in the rooms, except the pottery and the red step stool. I sell the kitchen chairs, I have examples in the blog of these slipper chairs, ( January 8, 2010, Furniture for Sale, Too). I can make them in your fabric, I sell upholstered furniture at cdhm.org. I know Ethan Allen has a web site, Google them up and look at all the beautiful furniture and get some ideas, think of how you could go about making something. Use the skills you have and make it as close to the picture as you can. Break it down in parts, what you can do and can't. Find the things you can do, gain skills and confidence doing those and move on to something else. That is how I did it. And I read every how-to article I could get my hands on. Books, don't pass these up at the shows. I have so many, if I got one thing out of one book I thought the price was worth it. If you have a used book store go in and see if they have any miniatures how-to books. I was very surprised when I found them at my used book store. She gets them in every so often, some of them are old, back in the 1970's, these aren't so good. You have to sit down and look through them to see if there is anything in them that can help you. For ideas I look for decorating books, they are a hoot when you find the old ones. I have an old Ethan Allen catalog from the 1960's. Home Depot has lots of beautiful books on trim and how to use it, those are good when you are building your doors and windows. They have books on bathrooms and kitchens, books and books, I love books. Another place to look is the antique section of the used book store. There a lots of books we can use there, too. I would love to be able to make pottery and china so I buy books that show shapes and patterns. 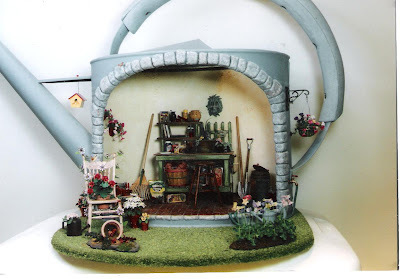 The teapot on the kitchen table is one I made from Fimo using a picture from a book on English porcelain and pottery, "The World of Wade, Book 2". I love Clarice Clift, I hope I spelled her name right, anyway that book had some things in it that looked like her style. I haven't found a book just on her at the used book store, yet. Information, I collect information and resource books. My problem is remembering what I have, so every once in while I take a quiet afternoon or evening and look through a big stack and make notes and stick tabs on the pages I want to remember. Before a project I will go through and make copies and stick everything in a folder just for the project and refer to it all of the time. Magazines, they have them on country, cottage, shabby chic, just about every decorating style. Next time you are buying groceries take a look at these, I bought many just for ideas on how to decorate a room box I want to do . . . . in . . . .the . . . . F. .U. .T. .U. .R . .E . . . . . I have many, to say the least. Pictures of My Current Project, Put On Hold! This is an unpainted pine catalog corner cabinet my daughter left here at home when she moved to Chicago. It was free to her, now free to me! 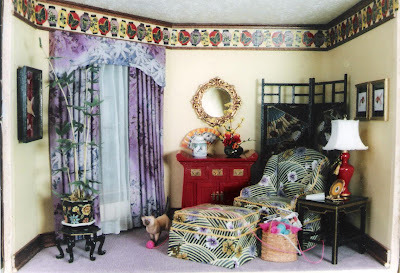 This all started in "Miniature Collector", they had an article about a miniatures store, the owner's mother had decorated a beautiful antique Queen Anne corner cabinet with a dollhouse inside. I have always wanted a dollhouse in a piece of furniture, a baby house. Suddenly I remembered the corner cabinet Katie left and now I have my baby house! Hope you enjoy the pictures, I have had fun figuring out how to make everything. I didn't make the pottery, that's a weakness of mine, love Jane Graber. Didn't make the red step stool, that's Aztec, I think. Made the doors and trim around the front hall, it's all poster board! Used my Dremel and it's workstand to make the turnings on the kitchen cabinets and the center island. The hall floor is from a rubber stamp from Michael's, big square block with different sides to stamp marble, how cool. The furniture is all from Ethan Allen, with a few changes I've thrown in. If you have any questions on how I did anything, just ask and I will gladly try to explain it here in the blog. The rug on the kitchen floor is a copy of one from the Internet printed on the ceiling paper from a previous blog entry. The counter tops in the kitchen are painted to look like red granite and the baker's rack has painted black granite. No, the kitchen sink in not a china one, I made that from wood and painted it, several times. The faucet is from aluminum tubing and wood, I turned the handles with my trusty Dremel and workstand. I didn't like the door hardware available so I made mine from wire, it's twisted, painted black and I used a diamond paper punch to make the escutcheons. The banjo clock on the wall is from a picture I found on the Internet. I laminated very thin slices of wood to create the curved outer box of the clock. I did make the teapot on the table, my experiment with fimo. I have more to do to the back porch. I made the door and screen door. I made the windows, the ones I can afford seem so chunky. I want 4 murals to represent the seasons. I have a goose, and I am going to dress her! The fabric on the couch and chairs by the bay window have been reduced on the printer. I do that alot, the color isn't always the same, but it works most of the time. I reduced the fabric for the chairs in the kitchen, too. I bought a coordinated set of fabric from Keepsake Quilting for the living room. I used Jacqueline Kerr Deiber's instructions to make a piece of caning for the back of the chair in front of the desk. I didn't drill holes in the chair, though. I laminated an oval and sandwiched the caning between it and the chair back. Going to do a bedroom and a yellow and blue "ducky" bathroom on the top shelf, that is if I ever get back to it. I especially love that this cabinet is in my workroom, with me, and that's where I am basically all of the time! This is my little dream house. P.S. Yes, that's the lady leg lamp from "A Christmas Story" I had to make one for myself. Don't where I'm going to put it, though. P.S.S. I don't know if you know this, I just learned it, but if you click on a picture you can make it bigger, full screen. I have been looking at some full size techniques and they can be applied to minis, too, just like the marbling I did before. The next technique I am going to tell you about is aging a painted finish. I could never get this to look right, then watching This Old House I saw the way to do it. I have a couple of ideas for cheater rugs. The first one uses wallpaper. I bought a roll of textured wallpaper at one of the big box home repair stores, Menard's. I like them, I have one in Springfield, IL, takes me about an hour to drive there, but it's worth it. This textured wallpaper is what we miniaturists buy from Hobby Builders as ceiling paper. I cut it 8 1/2" x 11" and using my printer I printed rugs off a Internet site selling full size rugs. If the rug has fringe glue a piece of muslin to the underside of the wallpaper, be sure you have straight grain at each end. Trim the sides even and leave at least a 1/4" at each end and ravel the muslin to look like fringe. I've used this for the big room size rugs and lots of little throw rugs. The next one isn't mine but it's good nonetheless. Have scrapes of carpeting left over? Make them into something special by cross stitching or needle pointing a border around them. I measure my piece of carpeting and make the inside border the same size. I needlepoint using 22 canvas, the size of canvas is your choice. You can use Aida cloth, too. After I am done I finish the edge of the border, everybody has their favorite way, and glue the carpeting into the middle of the canvas or Aida cloth. Another way is to cut the blank part of the fabric out and glue it with the carpet in that blank space onto muslin. I have another idea but I am waiting for www.dragonflyintl.com to send some suede paper to me. I tried flocked card stock from the scrap booking store, it caused a paper jam in the printer, several times, I'm hardheaded, I tried more than once to make it work. Going to try the suede paper to print rugs. Think it could be great! Kris P.S.S. on this blog, I am recommending buying suede paper from www.franticstamper.com, it works in your printer. A great big thank you to the new followers! Just a reminder if you have any questions about a project you are doing and need some ideas on how to do something I am always open to experimenting for you. Talk to you all in a bit, I have some cheater rugs to talk about. I call this Carl's Room because the little cat inside looks like Carl my daughter's Siamese. I have 3 cats living with me, all grandcats! I used d.Anne Ruff's chair and ottoman kit. This kit is very good. If you ever get a chance to buy one, try it, you'll like it! I started with the border at the top. I found this in the scrapbooking isle at Michael's. Ahh, the scrapbooking isle, so many things we can use. Although, I am a little disappointed that they have gone to large punches. There for a while I was getting some wonderful punches for flowers. I am still hoping and looking for an ivy punch. I know Hanky Panky Crafts has the handmade punches for ivy but they are too expensive for me just wanting to make ivy once in a while. So, I am still looking! Anyway, I loved the border, bought it, and kept it for a long time before I knew how to use it. The rest of the furniture I copied from catalogs. I do that a lot! The fish pictures on the wall are from the catalog. The lamp shade was tricky, gluing all of the pieces of card stock together. I used Elmer's, still the best for paper to paper. This is my watering can potting shed. It's a happy little place I wish I could go to this winter! My friend was looking for a fancy finish for her bathroom sink in one of her dollhouses. She had a Shenandoah lowboy kit she was going to use as a sink cabinet. I had an idea I had wanted to try out, but had nothing to use it for. So, I tried this faux finish technique on a House of Miniatures sideboard kit I had for her to see if she liked it. If you are using the kit, (Hobby Builders has the House of Miniatures lowboy kit on the "Save,Save" pages, #40024, for $8.99, they may still have the Shenandoah kit on line), put it together first. If you are going to put a sink in the top, (we used Hobby Builders clear vanity #975, $3.69, had to purchase the faucet set from another source, it's from MBS, www.modelbuilderssupply.com, the faucet set is about $14.00, it's very pretty and just the thing for this piece), you will have to make adjustments for the sink to go into the top while building the lowboy. Don't glue on the top, I have a faux finish for that, too. As you see in the picture I am showing you my practice piece without the sink inserted, makes a nice sideboard. This finish can be used on unfinished wood, and I suggest you try it out on a scrap first. If you are gong to use it on a piece that all ready has a finish on it I would sand it a bit to take off the shine. I bought all my stuff at Michael's: Deco Art Dazzling Metallics, Champagne Gold for the base color, Glorious Gold, Venetian Gold and Emperor's Gold. I used Delta's acrylic thinner, Americana Staining and Antiquing Medium with Folk Art Artist's Pigment Van Dyke Brown and Deco Art Triple Thick Gloss Glaze. Paint a base coat of champagne gold on the lowboy. I painted and sanded with 220 grit at least 2 or 3 times to get a good smooth finish. Mix each of the other 3 gold colors with the acrylic thinner, (about 1/4 part thinner to 1 part paint), on a styrofoam plate or something like that. You will have 3 puddles of paint. Sponge on, dipping the sponge into the paint, then dabbing the sponge on newspaper to blot off excess paint, then sponge onto the lowboy. I do this with the drawers in. Play with this, you can add the base color, champagne gold back into it, too. When you are satisfied with the finish let it dry. Apply one coat of Deco Art Triple Thick Gloss Glaze. Let dry. Mix the Folk Art Artist's Pigment Van Dyke Brown with the Americana Staining and Antiquing Medium. Brush on. I leave mine set a minute or 2. Dab off with a small piece of fabric or paper towel wadded up. You can do this over and dab off again until you like the finish. Let dry. I like to leave this overnight. Finish with Deco Art Triple Thick Gloss Glaze. You can change the brown and get a different look. My friend only uses 3 of the golds not 4. So this is up to you to play with it on scrap pieces to get the look you like. I think I've tried almost every body's way of making faux marble or at least read how they do it. I found this in my husband's "Fine Woodworking" magazine. I liked it and I seemed to do a passable job with this technique. You'll need soft artist's charcoal, I bought mine a Michael's. I tried several kinds to see what worked best. I think it depends what mood I'm in. If you don't like the finished piece you can sand everything off and start again, been there, done that! First sand smooth down to 220 grit or finer your top. Paint white, I used Delta's Magnolia White. Sand lightly, paint. Sand lightly and paint again. You want a super smooth finish, like glass so I know I did this at least 3 times. Now for the charcoal. For faux marble to look real it can't be symmetrical. It helps to have the real thing the article says, alas, I don't have a piece of marble. I suppose with real marble counter tops available you could go and take a digital picture of a piece and use it as inspiration. Back to business. Veins and fissures are grouped together in "drifts". Drifts should be asymmetrical and remind you of continental shapes, like starting at one corner with North America, through skinny Central America and back out at the opposite corner with fat and long South America. Vein and fissures should be of different lengths and widths, suggesting a torn, twisted fishing net. I hope this helps. After you have drawn the veins and fissures smudge parts of the veins with your fingertips. About 20% of the veins should be left unsmudged. The smudging of the charcoal takes the place of sponging with all the different colors of grey. So vary your smudging a bit. Now mix the Magnolia white with Americana Glazing medium, equal amounts. Sponge this onto the top. The veins will look as though they are deep in the "marble". Remember to dab the sponge onto newspaper before going to the top. You can add more sponging here, less there. Let this dry when you are satisfied. To finish I apply a layer of Deco Art Triple Thick Gloss Glaze. My friend did her top with pink marble and marbled her sink, too. This looks fabulous! I have moved some more furniture over from the CDHM.org site. This set reminds me of "Grandma's" living room. It's an overstuffed set upholstered in red velour trimmed in twisted embroidery floss. The set is finished with fringe at the bottom. Included with the sofa is an afghan and pillow and a pillow for the chair. The measurements for the sofa are: 3 1/4" tall, 5 3/4" wide and 2 3/4" deep. The measurements for the chair are: 3 1/4" tall, 3 1/2" wide and 2 3/4" deep. $25.00 plus $5.00 shipping in the U.S. for the sofa. $15.00 plus $5.00 shipping in the U.S. for the chair.